A factory, manufacturing plant or a production plant is an industrial site, usually consisting of buildings and machinery, or more commonly a complex having several buildings, where workers manufacture goods or operate machines processing one product into another. Between 1770 and 1850 mechanized factories supplanted traditional artisan shops as the predominant form of manufacturing institution, because the larger-scale factories enjoyed a significant technological and supervision advantage over the small artisan shops. The earliest factories (using the factory system) developed in the cotton and wool textiles industry. 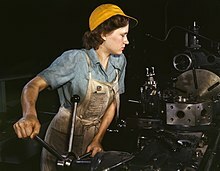 Later generations of factories included mechanized shoe production and manufacturing of machinery, including machine tools. Factories that supplied the railroad industry included rolling mills, foundries and locomotive works. Agricultural-equipment factories produced cast-steel plows and reapers. Bicycles were mass-produced beginning in the 1880s. Though factories dominated the Industrial Era, the growth in the service sector eventually began to dethrone them:[verification needed] the focus of labor in general shifted to central-city office towers or to semi-rural campus-style establishments, and many factories stood deserted in local rust belts. Much of management theory developed in response to the need to control factory processes. [verification needed] Assumptions on the hierarchies of unskilled, semi-skilled and skilled laborers and their supervisors and managers still linger on; however an example of a more contemporary approach to handle design applicable to manufacturing facilities can be found in Socio-Technical Systems (STS). ^ Landes, David. S. (1969). The Unbound Prometheus: Technological Change and Industrial Development in Western Europe from 1750 to the Present. Cambridge, New York: Press Syndicate of the University of Cambridge. ISBN 0-521-09418-6. ^ John Noble Wilford (13 October 2011). "In African Cave, Signs of an Ancient Paint Factory". The New York Times. Retrieved 14 October 2011. ^ "factory definition, meaning - what is factory in the British English Dictionary & Thesaurus – Cambridge Dictionaries Online". cambridge.org. ^ Mantoux, Paul (2000). The Industrial Revolution in Eighteenth Century: An Outline of the Beginnings of the Modern Factory System in England. Harper & Row. ISBN 978-0061310799. ^ Oates, Joan; McMahon, Augusta; Karsgaard, Philip; Quntar, Salam Al; Ur, Jason (September 2007). "Early Mesopotamian urbanism: a new view from the north". Antiquity. 81 (313): 585–600. doi:10.1017/S0003598X00095600. ISSN 0003-598X. ^ Knabb, Kyle Andrew (2008). Understanding the role of production and craft specialization in ancient socio-economic systems: toward the integration of spatial analysis, 3D modeling and virtual reality in archaeology (MA). University of California San Diego. ^ Gates, Charles (2003). Ancient Cities: The Archaeology of Urban Life in the Ancient Near East and Egypt, Greece and Rome. Psychology Press. p. 318. ISBN 9780415121828. ^ ALTEKAR, RAHUL V. (1 January 2005). SUPPLY CHAIN MANAGEMENT: CONCEPTS AND CASES. PHI Learning Pvt. Ltd. ISBN 9788120328594. ^ Marglin, Stephen A. (1 July 1974). "What Do Bosses Do? : The Origins and Functions of Hierarchy in Capitalist Production" (PDF). Review of Radical Political Economics. 6 (60): 60–112. doi:10.1177/048661347400600206. Retrieved 2 February 2019. ^ Musson; Robinson (1969). Science and Technology in the Industrial Revolution. University of Toronto Press. pp. 491–95. ^ Hunter, Louis C.; Bryant, Lynwood; Bryant, Lynwood (1991). A History of Industrial Power in the United States, 1730–1930, Vol. 3: The Transmission of Power. Cambridge, Massachusetts, London: MIT Press. ISBN 0-262-08198-9. ^ Bob Casey, John & Horace Dodge (2010). "Henry Ford and Innovation" (PDF). The Henry Ford. ^ Dickens, Phill; Kelly, Michael; Williams, John R. (October 2013). "What are the significant trends shaping technology relevant to manufacturing?" (PDF). Government Office for Science UK. ^ Fishman, Charles (June 2017). "The Future of Zero-Gravity Living Is Here". Smithsonian Magazine. ^ "The Bournville Story" (PDF). Bournville Village Trust. 2010. ^ Price 1986, p. 115. ^ Pugh 2000, pp. 192-198. "Mill" . Encyclopædia Britannica. 18 (11th ed.). 1911. This page was last edited on 22 April 2019, at 18:08 (UTC).